As of latest short disclosures, D. E. Shaw & Co, LP holds 5 big shorts in EU, with three of them against UK companies. The biggest % short is a 1.3% short in Plus500. Plus500 is a popular target among short sellers and has the highest short interest of all UK companies and 3rd highest in EU, with 12 hedge funds holding big shorts. In terms of % size, the second biggest EU short position of D. E. Shaw is Vitec Group (0.84%), while the third biggest is SAS AB (0.83%). Currently only D. E. Shaw holds a big short in Vitec Group, while SAS AB is also a big short of BlackRock Institutional Trust Company. 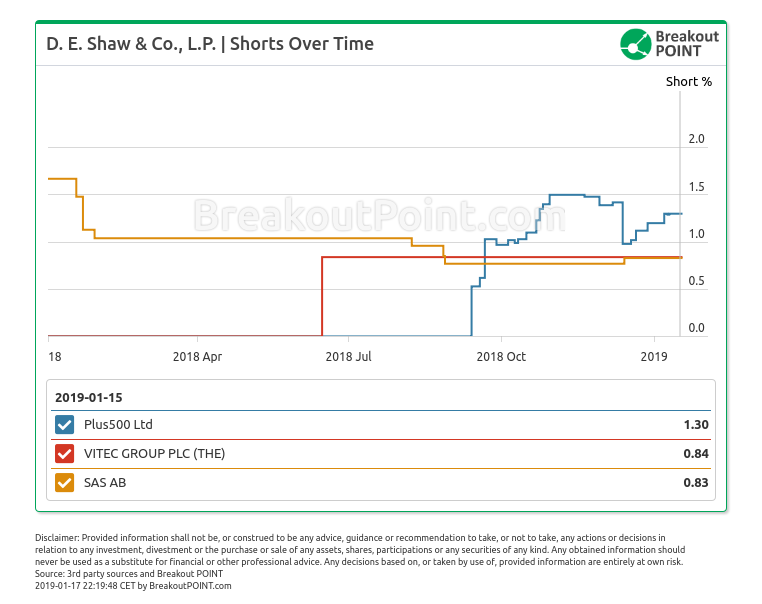 One of shorts that D. E. Shaw recently reduced is a short in Ferrari that first appeared in Aug'18, but was cut under 0.5% in Dec'18. Interestingly, another famous quantitative fund, AQR is the only current holder of a big short in Ferrari. AQR's big short is in place since Mar'18 and, as of latest disclosures, is 1.1% big. Overall, D. E. Shaw is not among the most active funds in our EU short selling records. In fact, with five big shorts, it is not among top 20 of most active funds. For comparison, we currently count 90 big EU shorts of AQR.